Sequel to the Bestseller, "Eve Get In Your Place"
Marriage was created and designed by the Creator. God, not man, made marriage. God designed marriage between one man and one woman, uniting them in holy matrimony. The two are to come together as one flesh in a joyous and fulfilling relationship. Marriage is covenant, commitment, and companionship meant for a lifetime. 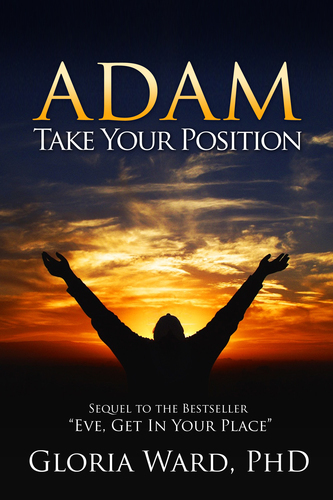 Adam Take Your Position, Gloria Ward’s insightful sequel to Eve Get In Your Place, is a call for Christian husbands to take their rightful leadership positions in the home. It provides biblical principles on the husband’s role and responsibility in the marriage. Just as God made marriage, He also established a divine order for the home. God commands that husbands love their wives as Jesus loved the church and gave Himself for it. Wives are to submit unto their husbands as unto the Lord. It is not about the husband being superior. Rather, a husband’s authority lies in being an obedient, responsible leader/servant to his family. Submission does not mean that a wife is slave to her husband. Rather, she is submitting to her Lord and obeying His direction for her home. The Bible, the inspired Word of God, gives instructions on how the husband and wife are to treat each other. Since God is the designer, why not try marriage His way before heading to divorce court? God hates divorce. Gloria Ward will help you discover what God has said on the subject of marriage. Knowing God’s perspective will help both husband and wife to properly function in what will be a blissful union.